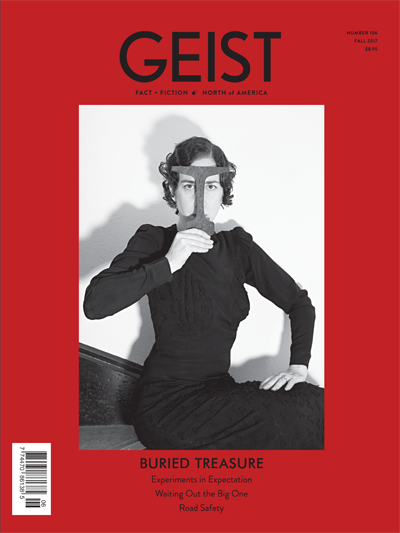 Geist is a Canadian literary magazine of ideas and culture. They publish the best that can be found in narrative (fiction and non-fiction), essays, poetry, reviews, photography, drawings, commix, puzzles and little-known facts of interest—with a special interest in fresh interactions between text and image. Geist strives to be articulate, humorous and identifiably Canadian. Their mandate is to find and encourage a wide audience for new and established Canadian writers and artists of merit. Currently, their readership extends from Newfoundland to Vancouver Island to Nunavut, with concentrations in the Lower Mainland of BC and greater Toronto. The Geist website, geist.com, receives 110,000 visits each year, and is supported by a strong social media presence: 3,000+ Facebook fans and friends; 11,400+ Twitter followers; 14,000+ subscribers to the weekly e-newsletter. Their inspiration is always found in the world around them and in the wealth of talented writers, artists, performers and creators, past and present, that they encounter in their work. They’re always on the alert for the great conversation or chance meeting that sparks a great Geist idea. Western Living Magazine Silk Road Music – Combining Culture and Music!